The pretty village of Acle is situated on the River Bure half way between Potter Heigham and Great Yarmouth. The village originally grew as a fishing village as in Saxon times all of the land between Great Yarmouth and Acle was below sea level so Acle was on the coast. During Roman times the village grew into a major trading port at the head of a large estuary, eventually the estuary silted up and rivers were formed in the channels created by peat digging. 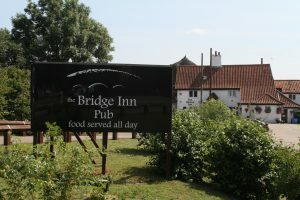 Moorings are located at Acle Bridge and The Broads Boating Co. where there is a pub and Mexican Tapas Restaurant. From the moorings there is a footpath that will take you into the heart of the village, approximately 1 mile. The village itself is well equipped with a convenience store, post office, butchers, medical centre, dentist, veterinary, bank and a pharmacy. You will also find coffee shops, takeaway restaurants and a pub. Thursdays are busy in Acle with the country auction from 10am, selling everything from home furnishings, bikes, cars, boats, electricals, seasonal fruit and vegetables and more. There is a children’s playground at the recreation centre as well as a concrete skate-park for skateboards, scooters and BMX bikes. To the south of the village lies 15th Century St Edmunds Church, a part thatched round towered church with an impressive font, a Farmers Market is held in the Church Hall every second Saturday of every month. Acle is great for walking being one of the gateways to the North Burlingham woodland walks through woods, orchards and open fields. There are also a number of circular walks which take in the surrounding countryside. A popular route starts in Acle and follows the River Bure north past Clippesby Drainage Mill and on to the village of Upton before crossing the fields past the church at Fishley and returning to the start. Regular trains run from Acle railway station to Norwich and Great Yarmouth.